An 83-year-old man presents to the emergency department with epigastric pain and tenderness associated with nausea and vomiting. Right upper quadrant ultrasound was performed as the initial diagnostic examination. 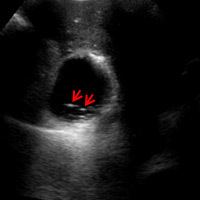 Transverse gray-scale ultrasound images demonstrated rising nondependent mobile echogenic foci (arrows) within the gallbladder lumen (Figure A). These mobile foci were best appreciated on cine clips and were consistent with effervescent gas bubbles (“champagne sign”). 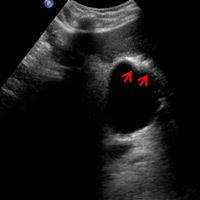 In addition, focal curvilinear echogenicity (arrows) with an associated chaotic display of continuous bright echo tails of variable strength and length (“dirty shadowing”) was noted within the gallbladder wall, confirming the presence of gas (Figure B). 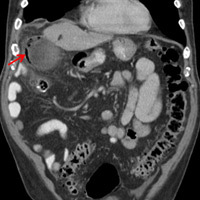 CT of the abdomen and pelvis with IV and oral contrast was subsequently obtained. 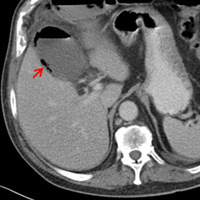 Axial and coronal CT images confirmed the presence of intramural gas (arrow) and demonstrated an air-fluid level within the gallbladder lumen. Also noted was gallbladder wall thickening with associated pericholecystic fat stranding consistent with acute cholecystitis (Figures C and D). EC is an uncommon, potentially life-threatening form of acute cholecystitis that affects men twice as often as women. The disease usually is seen in the elderly (mean patient age of 60). The majority of patients have diabetes mellitus (38% to 55%) and/or underlying atherosclerotic disease. Clinically, patients present with right upper quadrant pain, fever, leukocytosis, and bacteremia. Disease onset can be rapidly progressive, requiring emergent surgery. Mortality rate for acute EC ranges from 15% to 20% because of the increased incidence of gallbladder wall gangrene and perforation. Pathogenesis of EC is assumed to be secondary to vascular compromise of the cystic artery. Subsequent gallbladder ischemia is associated with anaerobic bacteria, with Clostridium welchii and Escherichia coli being the two most common causative organisms. Gas associated with infection generally is thought to consist of carbon dioxide and nitrogen secondary to the fermentation of glucose. Poor glycolysis at the tissue level in diabetic patients results in increased glucose concentrations within the interstitial fluid. On imaging, EC is diagnosed by the presence of gas in the gallbladder lumen (stage 1), within the gallbladder wall (stage 2), and/or within the pericholecystic tissues (stage 3) in the absence of abnormal communication between the biliary system and the gastrointestinal tract. Gas in the biliary ducts (pneumobilia) is not considered a manifestation of EC. Ultrasound typically demonstrates echogenic foci or focal curvilinear echogenicity with associated dirty shadowing in the gallbladder wall or lumen. A less common but more specific finding is nonshadowing echogenic foci rising from the dependent portion of the gallbladder lumen. CT, however, is the most sensitive and specific imaging modality for identifying gas within the gallbladder lumen or wall. EC is a surgical emergency requiring urgent cholecystectomy. Although laparoscopic cholecystectomy is described, the high rates of gangrene or perforation lead to conversion rates of up to 60%. Pathology reveals EC and cultures isolate gas-forming bacterial pathogens in 33% of cases. Percutaneous cholecystostomy drainage is reserved for patients with acute cholecystitis. EC is presumed to have a very friable gallbladder wall, thus percutaneous drainage may be complicated by biliary leak, perforation, and biliary peritonitis. — Alex Merkulov, MD, is the section head of women’s imaging and an assistant professor of radiology at the University of Connecticut Health Center. — Marco Molina, MD, is the section head of body imaging and an assistant professor of radiology at the University of Connecticut Health Center. — Michael Abramov, MD, is a radiology resident at the University of Connecticut Health Center. Wu CS, Yao WJ, Hsiao CH. Effervescent gallbladder: sonographic findings in emphysematous cholecystitis. J Clin Ultrasound. 1998;26(5):272-275. Gill KS, Chapman AH, Weston MJ. The changing face of emphysematous cholecystitis. Br J Radiol. 1997;70:986-991. Grand D, Horton KM, Fishman EL. CT of the gallbladder: spectrum of disease. Am J Roentgenol. 2004;183(1):163-170. Copyright © 2013 Great Valley Publishing Company Inc., Publisher of Radiology Today. All rights reserved.